Bob's Red Mill Nutritional Yeast is grown on enriched purified cane and beet molasses under carefully controlled conditions.With the addition of vitamin B12, Bob's Red Mill Nutritional Yeast is an ideal vegetarian support formula and has an appealing cheese flavor. It can be sprinkled over popcorn or salads, added to juice, cereal, smoothies, gravies, soups or casseroles, or used to make sandwich spreads. Sprinkle this all the time on steamed vegetables and use it to make vegan macaroni and cheese. Only wish it came in a resealable package. I was very happy to find this product here on Well.ca as for whatever reason it is hard to find in my city locally. The one I did find was $4 more than on here. Product speaks for itself & I appreciate the other reviews regarding use. Great product but Im a fan of bobs red mill products. Use this product for soups and anything I want to add a little more cheesey flavour. Such a great and easy product to use. Love adding this to my roasted cauliflowers! One of our favourite brands for nutritional yeast. It adds a nice cheesy/nutty flavour to our meatless & dairy free meals & sauces. Toddler loves it! Doesnâ€™t realize itâ€™s good for him to have and adds flavour/texture to dishes. Love that it is fortified with B12, not all brands are. Delicious! One of my favourite brands when it comes to nutritional yeast. Our whole family loves this. This is the only brand I'll buy! Fantastic product! Excellent for making vegan cheeze sauce. I trust this brand to deliver top quality products. I use the nutritional yeast where ever I can. Great taste and brand. We use this on our popcorn - great, healthy alternative to cheese. Will continue to buy this brand. As per other reviews, this is my go-to popcorn topping. A very easy & tasty way to get protein and vitamin B's . Great brand, I love nutritional yeast as a replacement for cheese. Will order again! Excellent product. Love this on popcorn alone with butter. Sometimes add dill to above. Use instead of salt on popcorn. This stuff is great! So convenient to get it from Bob's Red Mill and Well.ca rather than having to go to the specialty store. 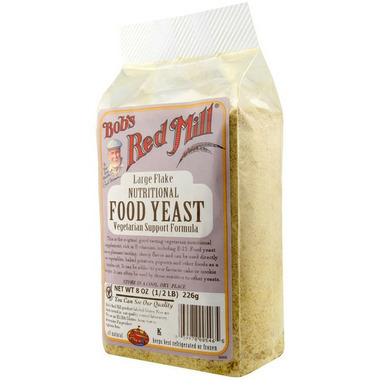 I've just started using Bob's Red Mill Nutritional Yeast. I put it on almost anything I can of in order to get the nutritional support needed for may age. Flavour is great and most importantly I trust the integrity of Bob's Red Mill products. Thank you! I love this brand of nutritional yeast, not only does it give you that cheese flavour its actually very good for your health. Also if your looking to make some cheese for nachos they have a recipe at the back of the bag with some other recipes as well to try. I would definitely try this brand out the next time you run out of nutritional yeast. Since all dairy products are off the menu, I use it to make a great cheese sauce. I love the cheesy flavor. I put nutritional yeast on a lot of cooking. Always on pasta. Also on Chilli or tofu scramble, and it's really good on popcorn too! This is some yummy on my salads so far. I plan to try it in smoothies and other recipes in the future. A great value ! It is my pasta sauce frequently, very nutitious, great flavour !Also great on stews or soups..
Yummy, I appreciate that this kind is fortified. I love this product!! As someone with digestive issues it's a constant struggle to make sure I get the proper nutrients. Protein in particular, this is a great way to get it. I've used it on kale chips and zucchini chips, mashed potatoes and have started adding it to smoothies. SO good!! So great! 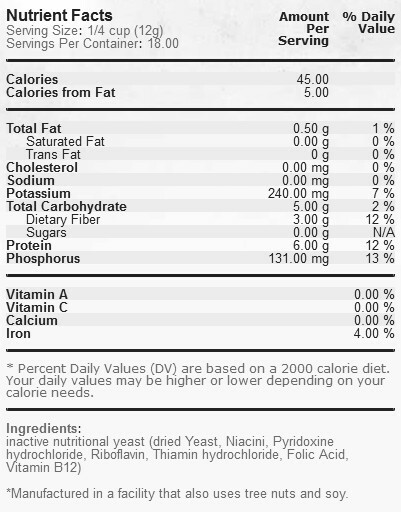 I love this nutritional yeast - I enjoy it on kale chips, popcorn, and eggs. I've tried other brands of nutritional yeast, and this is my favourite!!! This is has a delicious cheesy flavour that goes well as a topping on salads and vegetables. It is virtually tasteless in smoothies and adds the B12 needed on a vegan diet.